It’s a dangerous situation. An architect who specializes in restaurant design let loose to design his own kitchen. There’s no end to the resources and ideas at his disposal. But if you’re Kellen Minor of Decatur, GA you take a cue from the classics and give it a modern update. Architect Kellen Minor, principal at the firm ai3 was instrumental in the design of the Spanish-French-Southern-Fabulous Cooks and Soldiers restaurant on the hip west side Atlanta. More on him here. 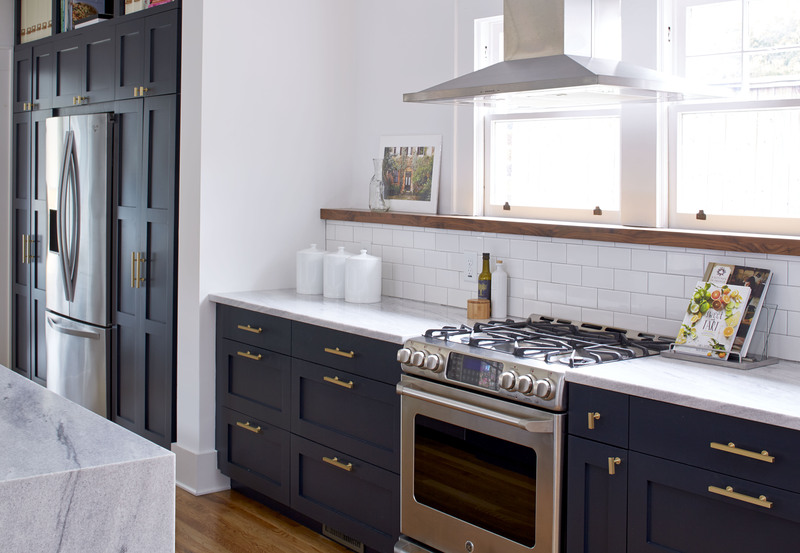 We stumbled upon Minor’s home kitchen this summer on Instagram, immediately drawn in by a crazy gorgeous combination of charcoal grey blue cabinetry, brass accents and the US marble, White Cherokee from Georgia. The cabinetry paint color is Railings. Farrow and Ball calls the color “handsome and commanding.” I think maybe they’re describing Minor’s kitchen. Minor chose mainly American appliances for his home kitchen including a GE Café Range, Zephyr Range Hood and Whirlpool Refrigerator. My wife Krystle and I purchased this home in 2011 with intentions to do an addition/renovation in the future. It was a 1,000 sq. ft two bedroom one bathroom brick bungalow built in 1925. We lived in the house for three years taking note of what worked and didn’t work about the house. We came up with many plans and finally settled on what we thought would be best for us now and in the future. In 2015 we began a nine month renovation and addition which included a new kitchen. Less than a year after completing the lengthy renovation, our son Rowan was born and we are enjoying the extra space. The kitchen sink is from Ikea and faucet by Giagni Fresco. 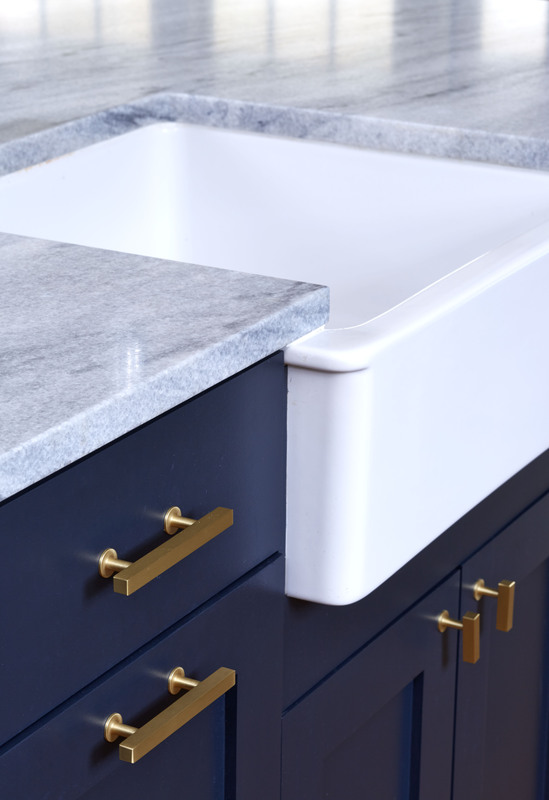 The cabinet hardware is Lews Hardware Brass Bar Series. Our house is located in the historic MAK neighborhood in Decatur, GA dating back to 1910. We were required to meet local historic guidelines that are sensitive to the exterior aesthetic of our addition. The MAK neighborhood (which is an acronym for our main three streets making up the district: McDonough, Adams, and Kings Highway) was recently listed on the National Register of Historic Places. This designation allowed us to take advantage of several tax incentives by following the The Secretary of the Interior’s Standards for Historic Rehabilitation. These guidelines set the stage for what we could do from an interior standpoint. The standards require that the new addition complement but not match the historic portion of the structure. The fabricator on the project was Stonecrafters USA, Inc. and the distributor was Daltile. Photography by Lauren Rubenstein. This was actually the first residential kitchen I have designed. As an architect I do a lot of boutique hospitality and restaurant design projects and was ready for the challenge of designing my personal kitchen. It all started with the idea of a kitchen that would remind us of our European travels and the many cafés where we enjoyed eating breakfast and sipping cappuccinos. I set out to create a kitchen that used traditional materials in ways that would satisfy our modern design aesthetic. First on the agenda was to create a large island where we could gather and enjoy cooking. We chose marble from the very beginning. 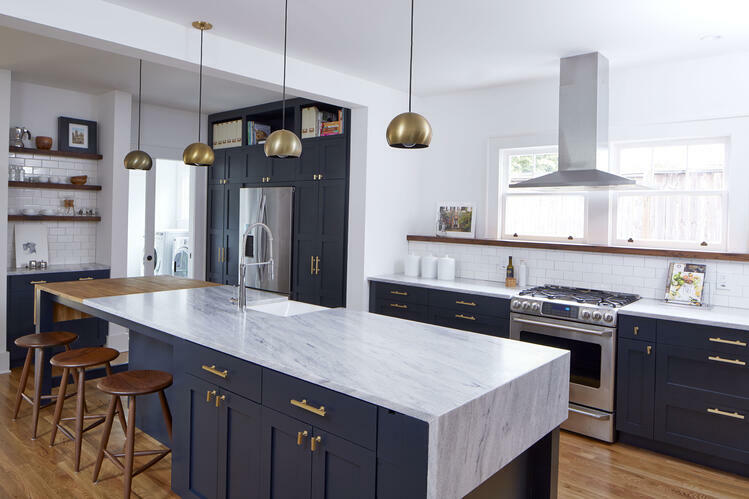 Keeping with the character of the house, I chose a shaker style cabinets, but painted them a modern dark color to compliment the grey/white marble. The island lighting is by Schoolhouse Electric, Isaac Pendants. We wanted the twelve foot six inch island to feel like a large family table so I put straight post legs on the corners. The legs allowed the countertop to float free of the cabinetry and flow like a sheet off of the edge towards the ground. 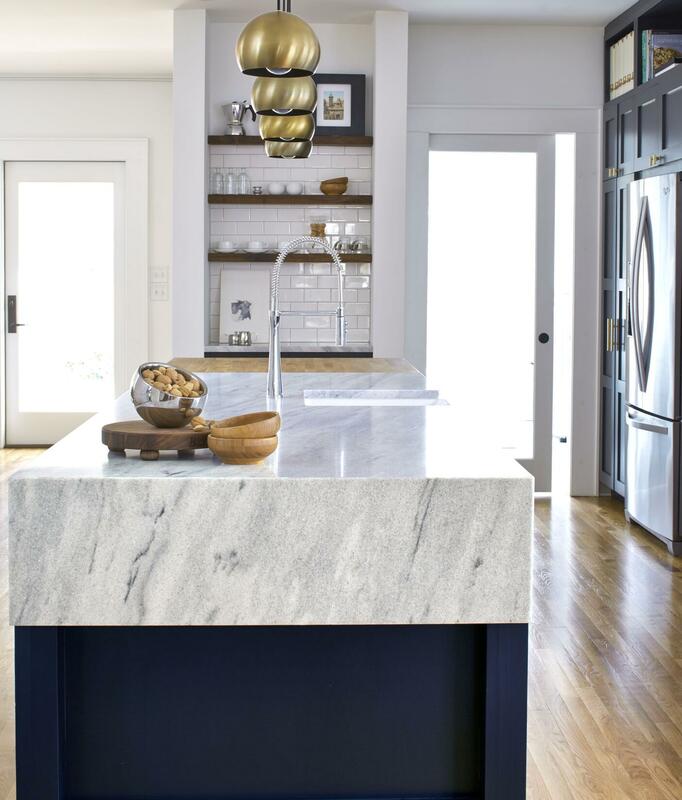 The marble slab is not long enough to cover the island in one piece so I changed materials to a butcher block top on one end that cantilevers and allows us to face each other. The fabrication process for the island was similar to other stone surfaces. The fabricator was very careful mitering the edge at the waterfall end because marble can chip if not handled correctly. I was nervous, but it came out perfect in the end. The window sill and display shelves were crafted from American Black Walnut. 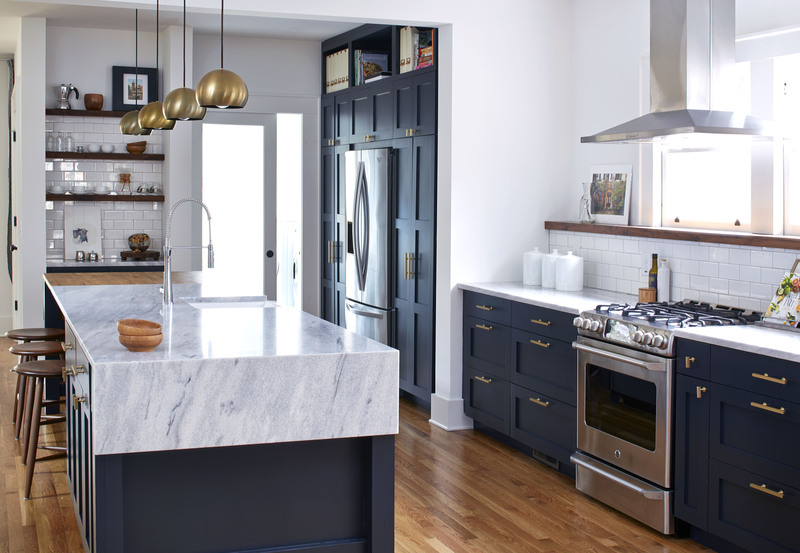 In addition to the kitchen design, Minor did all the millwork and installed the cabinetry by Barker Cabinets. The stools are from Room and Board. The walnut accent shelves and stools were used to warm the cool palette. The brass bar pulls and pendants added a touch of tradition in modern form. The kitchen is the central hub of the house. From the sink, one can see the TV in the family room, the backyard and the front door. It is the heart of the house. This was my first time using Georgia Marble personally, but my colleagues have used it on several hospitality projects. My wife and I were drawn to the beautiful grey veining [of the White Cherokee] almost like watercolor and immediately knew that it was perfect for the island. I always prefer to source locally where I can. Marble is a timeless natural material. It’s been used in kitchens throughout the ages. I love the character that it provides and it instantly takes us back to our European travels. With some simple care and understanding, it is a great option. Learn the simple care and cleaning techniques that keep marble countertops beautiful for decades. 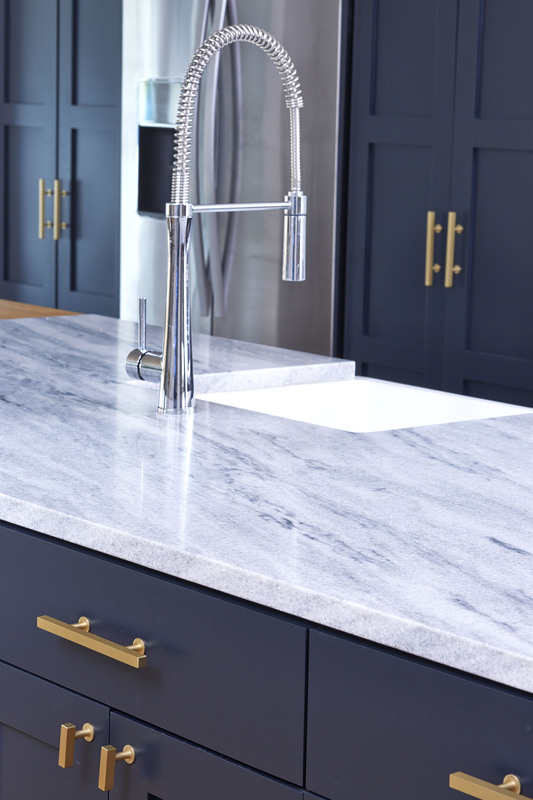 Download our marble care guide.